* Borosilicate is a type of glass that can withstand sudden temperature change. 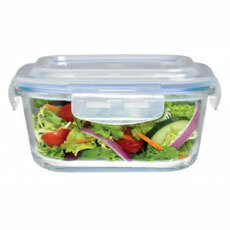 * 100% hygienic and food safe and BPA free. * Strong, durable and toughened glass. * Can withstand a high degree of thermal shock. * Can handle high oven temperatures of up to 600°C/ 1112°F. * Can handle cold freezer temperatures as low as -20°C/ -4°F. * Works well in oven, microwave, refrigerator and freezer. * From oven to table. * Non-porous, so it won't absorb food odors, flavor and stains.